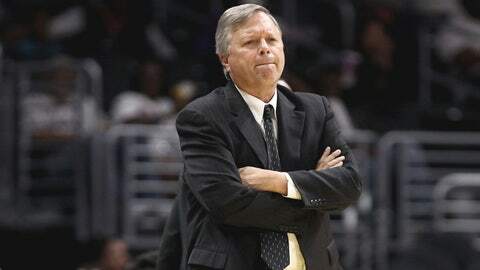 San Antonio Stars coach Dan Hughes left Wednesday's game in Washington on a stretcher, though the update on his condition was optimistic. Ivory Latta made two free throws with 6 seconds left and finished with 23 points in the Washington Mystics’ 66-63 victory over San Antonio on Wednesday night in a game marred by an injury to Stars coach Dan Hughes. "I already thought they had started to get the momentum right then but we were trying to stave them off but clearly it refocused them, it’s a scary thing, a very scary thing," Washington coach Mike Thibault said. "That’s probably a more concern of mine then the actual game. Hopefully he’s doing well." Tayler Hill made Washington’s first field goal of the fourth quarter at the 2:35 mark for a 64-56 lead. San Antonio scored the next seven, capped by Jia Perkins’ 3-pointer with 44 seconds left. After a Washington miss and a San Antonio turnover, Latta made her free throws and Perkins had a 3-pointer roll out at the buzzer.